I’m Margarita, Cache’s partner in empowering people to own their greatness and soar with love and confidence. 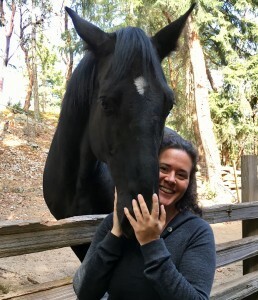 Together, Cache, the rest of the herd, and I live our purpose of providing a safe space and non-judgmental feedback for people to shift out of their heads and into their hearts. Today Cache and I decided to go for a ride. We have both been quite anxious lately from all of the activity on our property with new things being excavated and old things being restored. Of course, being the master teachers that horses are, I ended up getting way more than just a ride. The wisdom Cache shared with me as we spent time together is how to deepen trust (which as you know, is easier said than done). The thing that became clear is…in order to continue to build trust in any relationship, both parties need to continually let go of old patterns and stretch their limits of what each believes it means to be safe. Today, Cache needed to trust I would never intentionally put him in harm’s way. Even though logically he knows this through my proven consistency with him, the excavation brought up old fears and insecurities and he defaulted to old patterns. In return, I needed to push myself further by trusting he would not take off on me, something he used to do in his past as well as a genuine fear of mine based on past experience. (I was once thrown off a horse who spooked as we were galloping home and landed on my head. My body has now healed, however, the emotional trauma from that day still shows up every time I mount a horse.) I don’t let it stop me from riding, however, I do let it stop me from truly feeling free as I ride. Cache is in my life to help me push through this…as I am in his to help him push through his fears. All of this to say, it takes constant connection between both parties to work through this together. And it also takes time. So, be patient with yourself and others as there are many layers and textures beneath the surface for everyone. I didn’t end up handling the situation with Cache as well as I would have liked to on that ride – at some point, my fear did get the better of me once again. This time though, I came out of it with this lesson… “and that’s the win right there” says Cache. One more step forward for the both of us…because fear only wins if you let it…and Cache and I know we have many more rides in our future.